Barack Obama, the US president, has said his country is not seeking any claim on Iraqi territory, after holding talks with Iraq's prime minister in Washington. Obama said after the meeting with Nuri al-Maliki at the White House on Wednesday that the US will abide by previous pledges to pull its forces out of Iraq by 2011. "As I said before, we seek no bases in Iraq, nor do we make any claim on Iraq's territory or resources," Obama said. "Going forward, we will continue to provide training and support for Iraqi security forces that are capable and non-sectarian. "We will move forward with our strategy to responsibly remove American combat brigades from Iraq by the end of next August and fulfil our commitment to remove all American troops from Iraq by the end of 2011." 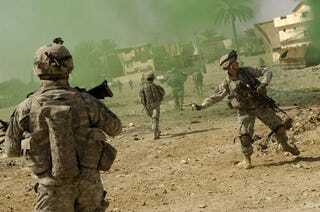 Under the Status of Forces Agreement (Sofa), the US still has 130,000 troops in Iraq but they are supporting Iraqi government forces rather than providing security.